Autism Understanding: Wandering, Bolting, and Leaving. Today, we are thinking about Avonte Oquendo and other children who left home, school or caregivers and did not survive that event. Years ago I was in a group of parents and a woman with a newly diagnosed 3 year old asked earnestly, “When will I be able to stop holding his hand?” Everyone laughed (not unkindly) and then the mother next to her leaned over and said, “How about never?” Everyone ought to hold a three-year old’s hand, of course, but she touched on something that is so hard to explain – she understood that the way she held her boy’s hand was different from the way the other Moms held their kids’ hands, and she wanted to know if that feeling would abate. The answer is…I don’t know. Here’s the thing about wandering – many people with autism don’t “wander.” They bolt. They leave. They hide. They vaporize. They run away from something they fear or toward someplace they think is better. “Wandering” makes it sound like someone wasn’t paying attention. What a lot of parents will tell you is that all they did was blink and the child was gone. They aren’t always exaggerating or equivocating. Some of these kids are lightning fast, and mine can even tell when I’m not thinking about him, and when I am. When he was small and I was looking at him but not thinking about him, he would always do something to snap me back to attention – it was a psychic choke chain that quite probably kept both of us alive. The way I look at it, in 1997 God sent someone to break into our house, forcing us to get an alarm system we otherwise never would have bought. 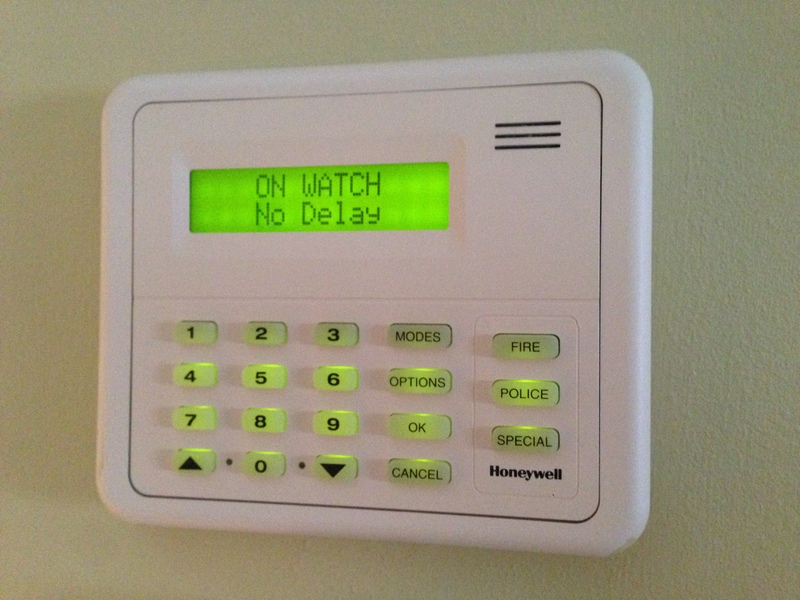 Along with its many alarm functions it has am “on watch” setting that sounds a beep every time a door to the outside is opened. When our boy began his disappearing act a year later, we were ready and we needed to be – we live on a pond, with a yard that is literally impossible to fence in (though for years I tried to figure a way we could do it without feeling making our yard look like the set of F Troop). But we were soon to learn that the door beeper was not enough, because when the weather is warm, doors aren’t always completely shut. Living near water is a source of tremendous joy and anxiety for ASD families. It was preschool orientation day, and the boy was three and half and as yet undiagnosed (1998 was a different time). Everyone in our playgroup had different orientation times so all of the moms and kids gathered at our house and people took the little ones up to school for orientation and the older kids stayed to play in the perfect September sunshine. I had already gone to school with our boy (and was anxious about sending him to preschool when he didn’t seem ready, but he was three and that what you were supposed to do) and was back at home making lunch and dealing with your standard “take that juice box outside, please” chaos. I ran upstairs to get something and when I came back down I passed the front door, which was wide open. I stopped. In front of it was a perfectly clean, recently removed diaper. No clothing, no socks, just a diaper. Oh, and a perfectly formed little swirl of soft serve ice cream-like poop on my new cute front hall rug. I looked out the open door into the front yard. I called to my friend Tracy to check the back – I knew it was my boy and I knew he was gone and she and I knew instinctively that this was no simple naked romp. 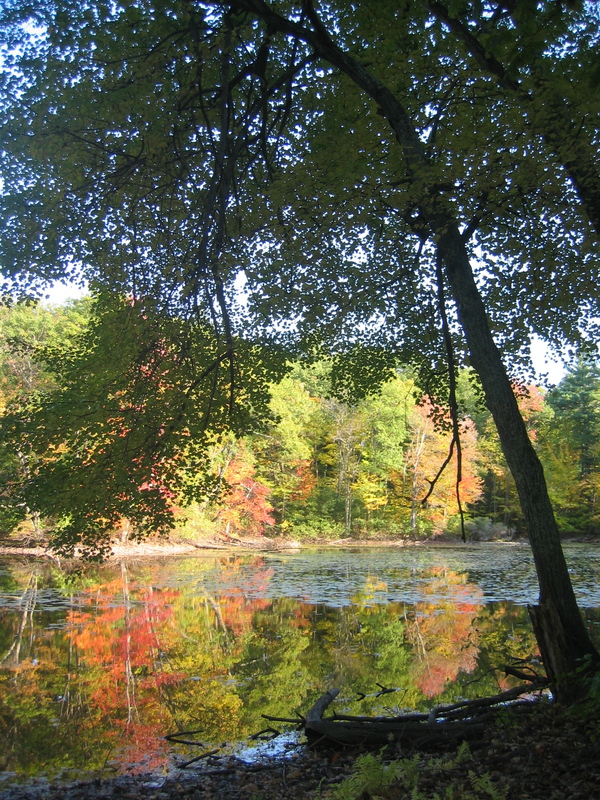 We scanned the shoreline along the pond – no ripples. She jumped in her car to check the state highway a few blocks away and I followed a hunch that took me down the street on the path we took for our morning and afternoon walks. Over the rise at the end of our very long driveway I looked up and saw our neighbor’s garage door was open – the Dad who worked from home (Andrew) was home. We had children the same age, we visited their home often, and I decided to check their yard and let him know we were looking for a renegade boy. First, I decided to check the perimeter of their house so that I would not have to bother Andrew if our boy was outside. I rounded the back of the house and glanced through their slider. There stood the boy, stark naked inside the neighbor’s playroom, proud, defiant and trembling with anticipation for the chase he knew was to come. The slider was locked – there was a wall of double paned glass between me and the boy. Our eyes locked; he knew he had the upper hand. If I took my eyes off him he would certainly bolt again but my odds of catching him were good – but how much damage could he do in the process? Where would he poop next? I bellowed “AnnnnDREW! !” Nothing. I had no choice, I bolted around to the front door (locked – how did the little bugger get into the house – oh, right, the garage). I knocked and rang the doorbell until Andrew came to the door with the phone in his hand and opened it, totally befuddled – I ran past him and got to the family room just in time to see a naked bottom round the corner and go up their back stairs. I yelled to Andrew to cover the front stairway in case I didn’t catch him in time, but I manage to scoop him up just as he reached the top of the front staircase. Poor Andrew stood agape at the foot of the stairs – there was no easy explanation for what had just happened and it was hard to know whether to laugh or cry but I suddenly knew that if either of us laughed I’d be repeating this ritual every day. We could not turn this into a game. the satisfaction of running to place on an established path that also provides some comfort and/or sensory input. I developed a number of theories about the poop gift in the front hall but they key lesson it holds in the bolting behavior part of the story is that he was angry and scared about going to preschool and didn’t have the speech to get that across. I completely underestimated how much he understood about what that day meant. He’d seen me drop his sister off at the school and did not want that for himself. He didn’t want to separate – he still doesn’t – and he knew exactly how to get my attention even if the full message didn’t come across. He used every tool he had to tell me he wasn’t ready for preschool, but in those days I was still under the impression that we were on a fairly typical trajectory – even though we had identified a significant speech delay and autism had come into the conversation. Despite the many concerns I had (too little speech, an inability to make choices) the professionals we were consulting at that time insisted that he didn’t fit the DSM criteria. He was too engaged, too empathetic and loving, and there was no hand flapping flapping or lining up of toys. No one talked about bolting or wandering in 1998. In the home setting he would bolt or hide when things were not going his way – for us it was and is a deliberate act. At school my assessment was that he was looking for attention, sensory input (the chase!) or to alleviate anxiety caused by speech skills that were developing too slowly for the ideas in his mind. It was a way to say that he wanted to negotiate for something. I knew the school program was not what it needed to be; tensions were high with parents, teachers and staff as it became increasing clear that two children were regressing and showing increased aggression. Unlike the Early Childhood Program, the elementary school teachers had zero training to allow for effective inclusion. We were standing on the sidelines, still trying to figure out what we needed. She told me that she had seen my son out through the glass doors of teh school, standing on the unfenced playground (which was adjacent to a vast open field with tall grass that with wooded conservation and on the far side). Knowing she was close enough to get to him if he ran, Ellen said she stood at the window and watched as he weighed his options while she checked her watch to see if he would bolt or if someone would come looking for him. Ten eternal minutes passed before she saw a teacher come and bring him inside. He had tried to get her to play tag, but he did not bolt. My heart still lodges in my throat as I write about it – it is the story that came to mind when I heard about Avonte. Ten minutes is a lifetime, enough time to get permanently lost in a rural community, enough time to run into the street, enough time to be scooped up by the wrong kind of person. Every child – every person – is motivated by something when they run away and very often we figure out what it was only when it is over and they are found – or not. Trains, water, animals, cars, can lure them away. Fear, crowds, noise, and defiance can drive them away. We’ve been lucky. It’s as simple as that. Lucky that we (and our friends) saw things when we did, lucky that he was motivated by things we could often figure out, lucky that he’s developed enough communication skills to talk through the things that make him want to escape, and lucky that he and we have not, so far, been in the wrong place at the wrong time. Doorknob motion sensor alarm. It’s ridiculously loud. The takeaway for me on our experiences is that people with ASD are most likely to happen when there is change, conflict, transition and confusion. For us, bolting and leaving seem to happen when neither one of us is entirely comfortable with the situation. 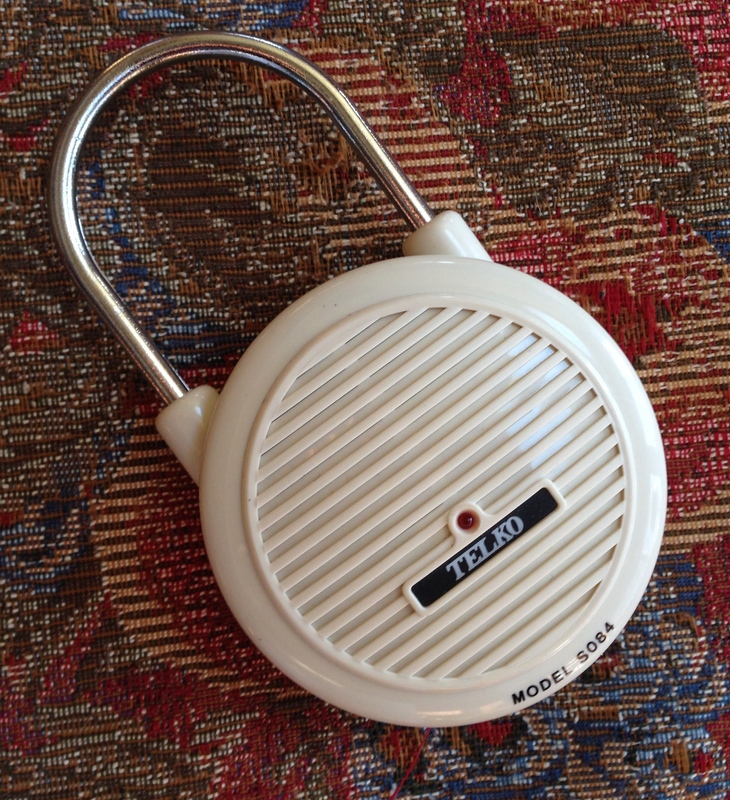 Until very recently, when we traveled we brought door alarms: motion sensitive devices that hang on door knobs and beep when anyone tries to turn a door handle. We still don’t have enough reliable GPS services in our area for wrist devices to work for us, but he carries a cell phone and he knows how to text and make and answer calls. But even though he can do all of those things and is now taller and stronger than I am and can ask for directions and cross a busy street by himself, my hand still twitches to hold his when we are together. I’m not sure that will ever stop. My son Will was a bolter and my daughter Mary was a wanderer. When Will was three, I had him when we would go out in a harness and Mary with a wrist band…with leashes. I got some strange looks. Probanly I might have been reported these days. A saving grace for us believe it or not was the fact that our kids had poor coordination and strength- -made it easier to catch them. As to how long it takes, it wasn’t until mary was 15 or 16 that I could be confident that she wouldn’t wander…that she would stay with me when walking through the mall.